Color(s): Black, tan, white, gray. May be solid or a blending of the colors. 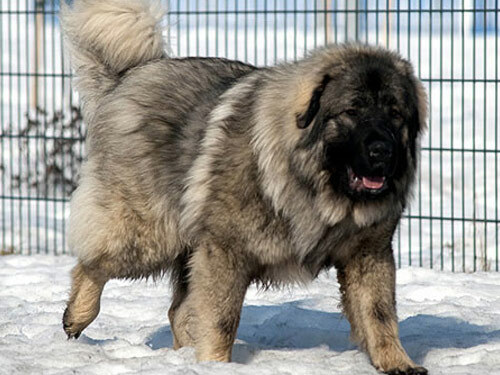 Commonly referred to as the Sarplaninac, this ancient livestock guardian originated in Yugoslavia. Until 1970 this breed could not be legally exported from their native country. They are not well known in the United States and are considered to be rare and difficult to obtain. A medium-sized breed, the Illyrian Sheepdog displays extraordinary strength and makes a formidable opponent. They are well-built, muscular, agile, and fearless. The Illyrian Sheepdog is not affectionate or loving and is not well-suited as a companion or family pet. Their main focus is their flock. They do not trust anyone: family, friend, or stranger. The Illyrian Sheepdog breed is overly protective of any animal on their property. For this reason dogs and other household pets are not recommended. They do well with older, considerate children, although children are generally not given any attention. Illyrian Sheepdog's require regular brushing to remove dead hair and debris. Bathing should only be done when absolutely necessary. Due to the rarity of this breed there are no known health issues. A double coat breed, the Illyrian Sheepdog has an outer coat that is long, straight, and rough in texture. The under coat is fine, short, and dense. The hair is longer and more profuse on the tail, breeches, back of legs, and neck. The Illyrian Sheepdog is highly intelligent and very defiant. They are not meant to be socialized. Any training is futile with this independent breed as they do not respond to commands. The Illyrian Sheepdog breed is not recommended for city or apartment living. The Illyrian Sheepdog does best in a rural setting on a working farm where it is able to protect livestock.